Classic elegance and craftsmanship describe our Marine Corps Flag Shadow Box for awards, medals and photos. 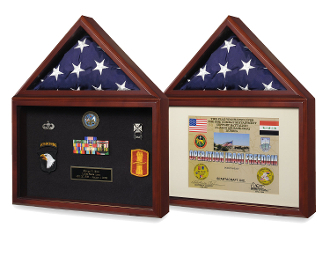 Create a perfect display for your 3-ft x 5-ft flag and accompanying certificate or medals. Ideal for storage of flags flown over the Capitol, along with certificate. The precut mat is included to fit a standard 8 ½-in. x 11-in. certificate. 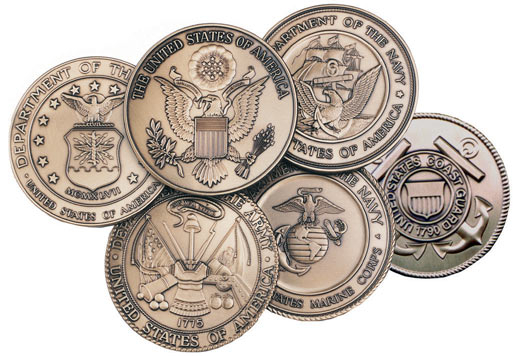 Simply remove the mat to configure as a shadowbox for awards, medals, photos, etc. Comes with both blue and black background and material and instructions for easy mounting of your items. Glass front with turn button closures on back of both the display and flag case compartments. This box is designed to be hung on the wall, but can be placed on a shelf. The overall size of this Flag Shadowbox measures 21 in. tall x 17 in. wide x 3.5 in. deep. The containment section is 10.25 in. wide x 15.5 in. tall x 2.38 in. deep. And the flag section is 13.75 in. x 6.75 in. x 2.38 in. Available in Cherry or Oak. 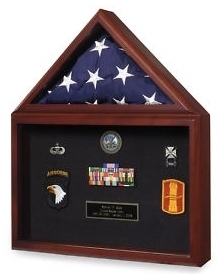 This Flag Shadow Box for awards, medals and photos is made from solid wood, providing an excellent display for rank insignia and medals with a flag case. Truly worthy of holding the flag of the U.S. M this display case honors those sailors who have revered the flag’s colors for decades. The Our solid-built display cases can be set off against other pieces of furniture in any room, or they can harmonize well with the décor of any room, office or hall. See how our hardwood display cases create an ambiance of security, solidity and warmth, and why they are more popular than metal or acrylic cases. This Military Flag and Medal Display Case was exactly as described. It blends in beautifully with the furniture in my office. Thanks for the prompt delivery and superb customer service , who handled all of my concerns in a professional, yet friendly way.